In 1844, Lydia Sigourney asserted, “Man’s warfare on the trees is terrible.” Like Sigourney many American women of her day engaged with such issues as sustainability, resource wars, globalization, voluntary simplicity, Christian ecology, and environmental justice. Illuminating the foundations for contemporary women’s environmental writing, Fallen Forests shows how their nineteenth-century predecessors marshaled powerful affective, ethical, and spiritual resources to chastise, educate, and motivate readers to engage in positive social change. Fallen Forests contributes to scholarship in American women’s writing, ecofeminism, ecocriticism, and feminist rhetoric, expanding the literary, historical, and theoretical grounds for some of today’s most pressing environmental debates. 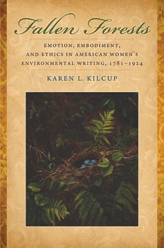 Karen L. Kilcup rejects prior critical emphases on sentimentalism to show how women writers have drawn on their literary emotional intelligence to raise readers’ consciousness about social and environmental issues. She also critiques ecocriticism’s idealizing tendency, which has elided women’s complicity in agendas that depart from today’s environmental orthodoxies.